On December 27th I had to say goodbye to my very best and most faithful friend—my little dog Pepper. She had been a part of my life since she was just 18 months old and for more than 15 years she had given me so much love and joy. 2012 had been a hard year for Pepper. I hadn't had the heart to say it before—it only made me sadder each time I thought of telling anyone and it made it all so much more real, and the end seem so inevitable—for most of the year she had been battling cancer. It was a very hard and tearful time for both of us. But in spite of all the hardships she endured, she always managed to bring a smile to my face. Looking at her you would have never known she was sick—she continued to run and play, she always kept that same sparkle in her eye, and we did our very best to enjoy each and every day to it's very fullest. In the end, it wasn't the cancer that took my little girl from me. And for that I am actually very thankful. It was heart failure. At 16 1/2 years old, her little body was just wearing out and as much as she loved life and would have kept on trying to live, I knew she only had a short while and it had suddenly become so difficult for her. I didn't want her to be unhappy and in pain. For nearly three days she hadn't been able to sleep a full night because she was breathing so hard. Her body was getting weaker, and she was so tired. She deserved so much better. For the past 15 years she had depended on me to make all the right decisions for her, and I had always known that part of that very special responsibility included one day making the ultimate decision for her. And so I had to say goodbye. It was finally time and we both knew it. I had let her go. It was the kindest thing I could do. My heart is broken now and so empty feeling. I've decided I need to take a studio break. I'm not sure for how long. Right now everything is so much harder without her at my side—she was my studio companion—always there to greet me in the morning, to follow me around as I took beads to and from the freezer and oven, to remind me when I needed to get out and get some fresh air, she was there to entertain me with her snoring when I forgot to turn on the music, she was there to listen to all my dreams and ideas—good or bad, she was always there to give me that sweet smile and a wet kiss whenever I was down… she was just there for anything and everything. My shop will still be open with my remaining stock and I'll be shipping those orders. And for those of you who have already worked out some made-to-order purchases with me, don't worry, I'm still working on them, and they'll be completed on time. But new beads and restocking my shop, I'm going to put off for a while. But before I go I just want to also say thank you to each and everyone of you that purchased beads and jewelry from my shop this year. Without your help, I would never have been able to give Pepper the care she needed. I can't even begin to tell you how much that has meant to me. Thank you SO very, very much. Right now I just need some time to dry my tears. Colors in the Woods goes to… Skye! Blue Roses and a Bluebird goes to… Claire! Racing Ponies goes to… Renetha! And finally, Red Roses goes to… Leigh Thow! Thank you all so much for entering and also for sharing my giveaway and sale! 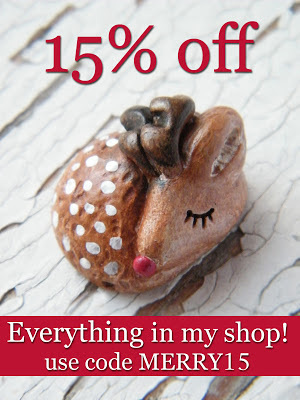 And don't forget about my whole shop sale—everything listed is 15% of with code MERRY15, through December 31st. Wishing you and your loved ones a joyful Christmas and a most wonderful New Year! "Blue Roses and a Bluebird"
Use code MERRY15 for 15% off your entire purchase! Hi all! I'm taking the next couple weeks off from bead making… and in order to keep you from getting too bored while I'm away, I'm running a year end sale! Everything in my shop is ready to ship, so right now there's no wait for me to make your beads… but that also means when they're gone, they're gone until I turn the bead making machine (me!) back on again on January 1st—so beads will be restocked by mid to late January. So… now I'm off to spend some time with family, bake some pies and cookies (you probably thought I could only bake beads, I bet! Well, you are wrong! ;-), and play with my little girl, Pepper. "Are you done with the beads NOW?" She is the cutest little sleepy critter bead, isn't she?! I won't be totally gone… I'll peek in now and then, and of course I'll be busy in the shipping department!